Apologetics Press - How Important is the Bible to America’s Survival? How Important is the Bible to America’s Survival? There was a time in American civilization when the Bible was integral to every aspect of life. It was reverenced in the home. It was taught and used in the schools. It was incorporated into our laws and integrated into our courts of justice. It was quoted by politicians, judges, educators, and even entertainers. It permeated the great literature of Western Civilization. But with the multitude of attacks on the integrity, inspiration, and inerrancy of the Bible over the last century, respect for the Bible has waned significantly. Particularly after World War II, confidence in the Bible as the divine Word of God has been seriously undermined in America. Amazingly, a recent poll still shows the Bible to be the all-time favorite book for American adults: “Researchers said it’s rare to find such consensus among Americans, regardless of gender, education level, geographic location, race/ethnicity or age” (Hamm, 2008). Surely I have taught you statutes and judgments, just as the Lord my God commanded me, that you should act according to them in the land which you go to possess. Therefore be careful to observe them; for this is your wisdom and your understanding in the sight of the peoples who will hear all these statutes, and say, “Surely this great nation is a wise and understanding people.” For what great nation is there that has God so near to it, as the Lord our God is to us, for whatever reason we may call upon Him? And what great nation is there that has such statutes and righteous judgments as are in all this law which I set before you this day?... You shall therefore keep His statutes and His commandments which I command you today, that it may go well with you and with your children after you, and that you may prolong your days in the land (Deuteronomy 4:5-8,40, emp. added; cf. 5:33; 6:2-3,18). Set your hearts on all the words which I testify among you today, which you shall command your children to be careful to observe—all the words of this law. For it is not a futile thing for you, because it is your life, and by this word you shall prolong your days in the land (Deuteronomy 32:46-47, emp. added). The instant I speak concerning a nation and concerning a kingdom, to pluck up, to pull down, and to destroy it, if that nation against whom I have spoken turns from its evil, I will relent of the disaster that I thought to bring upon it. And the instant I speak concerning a nation and concerning a kingdom, to build and to plant it, if it does evil in My sight so that it does not obey My voice, then I will relent concerning the good with which I said I would benefit it (Jeremiah 18:7-10, emp. added). I will never forget Your precepts, for by them You have given me life. Oh, how I love Your law! It is my meditation all the day. You, through Your commandments, make me wiser than my enemies; for they are ever with me. I understand more than the ancients, because I keep Your precepts. How sweet are Your words to my taste, sweeter than honey to my mouth! Through Your precepts I get understanding; therefore I hate every false way. Your word is a lamp to my feet and a light to my path (Psalm 119:93,97-98,100,103-105, emp. added). For the word of God is living and powerful, and sharper than any two-edged sword, piercing even to the division of soul and spirit, and of joints and marrow, and is a discerner of the thoughts and intents of the heart (Hebrews 4:12, emp. added). If you abide in My word, you are My disciples indeed. And you shall know the truth, and the truth shall make you free.... He who rejects Me, and does not receive My words, has that which judges him—the word that I have spoken will judge him in the last day.... Sanctify them by Your truth. Your word is truth (John 8:31-32; 12:48; 17:17, emp. added). This means that the Bible is the most important book on the planet, in a class by itself, surpassing all others. Indeed, whereas all other books are the word of men, the Bible is the Word of God. How important was the Bible in the minds of the architects of American civilization? History is decisive on this point as well: the Founders viewed the Bible as absolutely indispensable and integral to the survival of the Republic. It is no wonder that, after a decade-long study in an effort to identify where the Founders acquired their ideas for the formation of the nation and the writing of its constitutions of government, political scientists conducting the study concluded that the Founders cited the Bible in their political utterances far more often than any other source (see Lutz, 1988, pp. 140-141). Article III. [As the happiness of a people, and the good order and preservation of civil government, essentially depend upon piety, religion and morality; and as these cannot be generally diffused through a community, but by the institution of the public worship of God, and of public instructions in piety, religion and morality: Therefore, to promote their happiness and to secure the good order and preservation of their government, the people of this commonwealth have a right to invest their legislature with power to authorize and require, and the legislature shall, from time to time, authorize and require, the several towns, parishes, precincts, and other bodies politic, or religious societies, to make suitable provision, at their own expense, for the institution of the public worship of God, and for the support and maintenance of...teachers of piety, religion and morality, in all cases where such provision shall not be made voluntarily (Constitution of the...,” emp. added). The Framers of the Massachusetts constitution believed that “public instructions in piety, religion and morality” could come only from the Bible. The Continental Congress considered the Bible so important to national life that they actually passed resolutions to make certain that Bibles were in abundance in the country. The Continental Congress directed a committee to investigate ways by which Bibles could be secured. The committee made its report on September 11, 1777, stating “that the use of the Bible is so universal, and its importance so great...your Committee recommend [sic] that Congress will order the Committee of Commerce to import 20,000 Bibles from Holland, Scotland, or elsewhere, into the different ports of the states in the Union.” Congress promptly ordered the importation (Journals of..., 1907, 8:734-745, emp. added). Four years later, as the colonies suffered from the effects of the British embargo, and as the shortage of Bibles continued, importation became sufficiently impractical that Congress was again petitioned for approval, this time to print Bibles in America, rather than to import them from outside the country. The request was approved and upon completion of the printing, on Thursday, September 12, 1782, the full Congress not only approved the edition, but gave permission for their endorsement to be placed in the front of the Bible! It read: “Whereupon, Resolved, That the United States in Congress assembled...recommend this edition of the Bible to the inhabitants of the United States” (Journals of..., 1914, 23:574). Who today would believe that the members of the original Congress of the United States considered the Bible so important to national existence that they would expend effort—even in wartime—to make certain that Bibles were available to the American population? The present widespread loss of respect for and interest in the Bible, is disgraceful, and if continued, will spell our national doom. The Holy Scriptures...can alone secure to society, order and peace, and to our courts of justice and constitutions of government, purity, stability, and usefulness. In vain, without the Bible, we increase penal laws and draw entrenchments around our institutions. Bibles are strong entrenchments. Where they abound, men cannot pursue wicked courses (as quoted in Steiner, 1921, p. 14, emp. added). [W]ere you to ask me to recommend the most valuable book in the world, I should fix on the Bible as the most instructive, both to the wise and the ignorant. Were you to ask me for one, affording the most rational and pleasing entertainment to the inquiring mind, I should repeat, it is the Bible: and should you renew the inquiry, for the best philosophy, or the most interesting history, I should still urge you to look into your Bible. I would make it, in short, the Alpha and Omega of knowledge; And be assured, that it is for want of understanding the scriptures, both of the Old and New Testament, that so little value is set upon them by the world at large (1801, p. xv, emp. added). 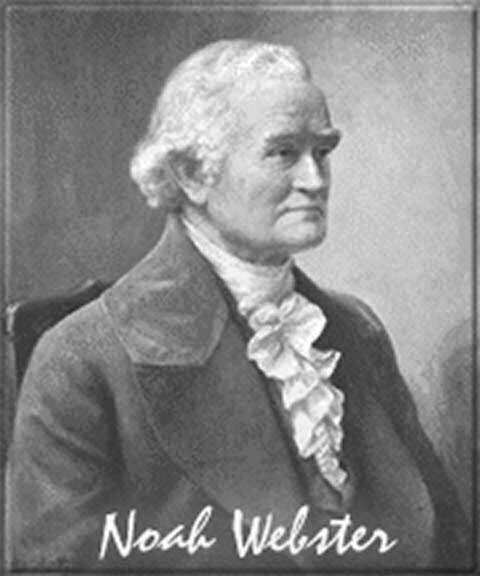 Noah Webster asserted: “[C]itizens should early understand that the genuine source of correct republican principles is the Bible, particularly the New Testament, or the Christian religion” (1832, p. 6). Webster also insisted that “[t]he Bible is the chief moral cause of all that is good and the best corrector of all that is evil in human society; the best book for regulating the temporal concerns of men” (1833, p. v). 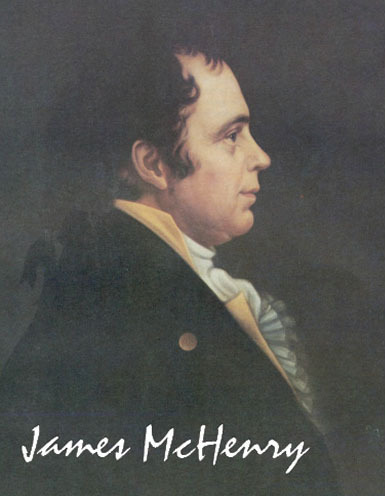 He further claimed: “All the miseries and evils which men suffer from vice, crime, ambition, injustice, oppression, slavery and war, proceed from their despising or neglecting the precepts contained in the Bible” (1832, p. 339). Who today believes these statements? According to this prominent Founding Father, the Bible is responsible for our Republic, our civil liberty, our constitutions of government, and for correcting and regulating human behavior. Yet, we have banned the Bible from public schools, we allow college professors to impugn its inspiration and integrity, and we disallow its use in jury deliberation rooms (People v. Harlan, 2005). 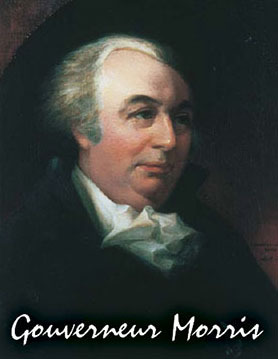 Constitution signer, Gouverneur Morris, observed: “The reflection and experience of many years have led me to consider the holy writings not only as the most authentic and instructive in themselves, but as the clue to all other history. They tell us what man is, and they alone tell us why he is what he is” (1821, p. 30). Declaration of Independence signer, Dr. Benjamin Rush, declared that the Bible “should be read in our schools in preference to all other books from its containing the greatest portion of that kind of knowledge which is calculated to produce private and public temporal happiness” (1798, p. 100, emp. added). 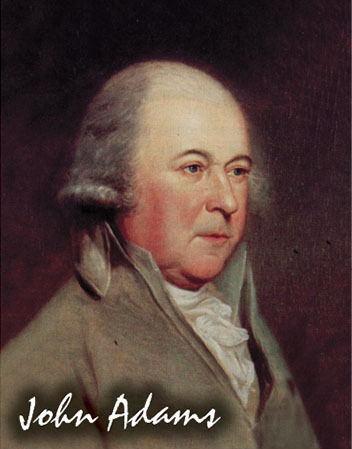 Signer of the Declaration and second President of the United States, John Adams, wrote in his diary on February 22, 1756: “Suppose a nation in some distant region should take the Bible for their only law book and every member should regulate his conduct by the precepts there exhibited.... What a Eutopia, what a Paradise would this region be” (1854, 2:6-7, emp. added). In a letter to Thomas Jefferson on December 25, 1813, John Adams stated that “the Bible is the best Book in the world” (1856, 10:85). Robert Winthrop, who was Speaker of the House in the 1840s, explained: “Men, in a word, must necessarily be controlled either by a power within them or by a power without them; either by the Word of God or by the strong arm of man; either by the Bible or by the bayonet” (1852, p. 172, emp. added). Such indications of the importance of the Bible to national health were typical of the mass of American Founders. 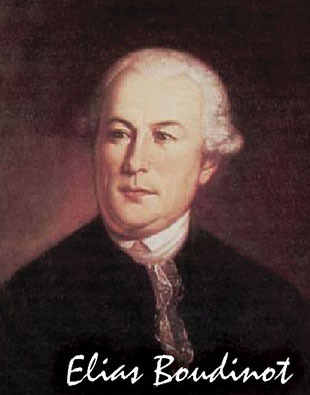 Some Founders served as Christian chaplains in the Continental Army, including Abraham Baldwin, who signed the federal Constitution and served in both the U.S. House and Senate; Joel Barlow, who filled various foreign diplomatic roles; and Robert Treat Paine, a preacher who signed the Declaration of Independence and served as a Massachusetts Supreme Court judge. Still another indication of the central place of the Bible among America’s Founders is seen in the fact that U.S. Presidents still follow the tradition, set at the very beginning of the Republic by the “Father of our country,” by placing their hand on a copy of the Bible while being sworn in as President (“Bibles and Scripture...”). History even records that immediately after taking the oath of office, George Washington leaned down and kissed the Bible (“Inaugurals of Presidents...”). The Bible has been so thoroughly part and parcel of American culture that a Bible is still included in most motel and hotel rooms across America. Indeed, the judiciary of America has been a primary perpetrator in the war on the Bible, as the U.S. Supreme Court banned the practice of requiring students in public schools to read Bible verses every morning (Abington School District v. Schempp, 1963), banned postings of the Ten Commandments in public school classrooms, since worship of God is included in them (Stone v. Graham, 1980), and banned teachers from sitting at their desks and silently reading the Bible in front of students during a classroom silent reading period (Roberts v. Madigan, 1990). And what of the incessant, ongoing assault in universities across America for the last 50 years, as professors have paraded before their students, steadily chipping away at the integrity of Bible. Such instances are legion. 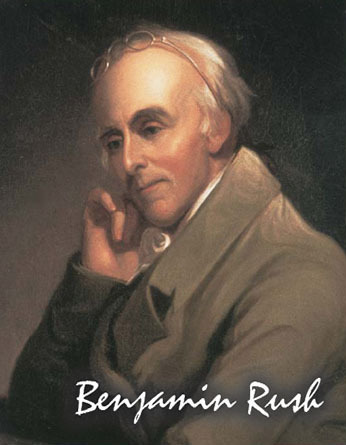 Founder and physician Benjamin Rush’s words, written in 1789, could not be more relevant to our predicament: “The great enemy of the salvation of man, in my opinion, never invented a more effectual means of extirpating Christianity from the world than by persuading mankind that it was improper to read the Bible at schools” (1951, 1:521). This systematic cleansing of American culture in an effort to jettison the Bible from public life is absurd, demented, and utterly foolish. If the Bible is correct (and the Founders of American civilization believed it to be), the future of the Republic is inextricably linked with and inherently dependent on the extent to which Americans are willing to return to an intimate acquaintance with the Bible. In a speech delivered in Denver, Colorado in 1911, President Woodrow Wilson referred to the Bible as “the great charter of the human soul, as the ‘Magna Charta’ of the human soul” (Wilson and DiNunzio, 2006, p. 54). 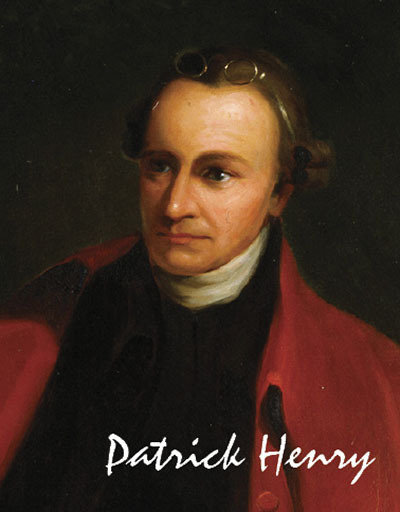 He insisted that “America was born a Christian nation. America was born to exemplify that devotion to the elements of righteousness which are derived from the revelations of Holy Scripture” and that Americans must “realize that part of the destiny of America lies in their daily perusal of this great book of revelations, that if they would see America free and pure they will make their own spirits free and pure by this baptism of the Holy Scripture” (p. 59, emp. added). The 30th President of the United States, Calvin Coolidge, warned: “The foundations of our society and our government rest so much on the teachings of the Bible that it would be difficult to support them if faith in these teachings would cease to be practically universal in our country” (as quoted in Thomas, 1996). Time will tell. My people are destroyed for lack of knowledge. Because you have rejected knowledge, I also will reject you...; because you have forgotten the law of your God, I also will forget your children. The more they increased, the more they sinned against Me; I will change their glory into shame (Hosea 4:6-7, emp. added). Awake to righteousness, and do not sin; for some do not have the knowledge of God. I speak this to your shame (1 Corinthians 15:34, emp. added). We remove the Bible from public life to our shame—and at dire peril. May God bless us with a sufficient number of citizens, educators, preachers, and political leaders who will recall America from her shame. May God bless Americans with the will to return to the Bible in order to bask in the marvelous light of His glorious Word (1 Peter 2:9). Abington School District v. Schempp (1963), 374 U.S. 203 (1963), The Oyez Project, [On-line], URL: http://www.oyez.org/cases/1960-1969/1962/1962_142/. Adams, John (1850-1856), The Works of John Adams, Second President of the United States, ed. Charles Adams (Boston, MA: Little, Brown, and Company). American Bible Society (1816), Constitution of the American Bible Society: Formed by a Convention of Delegates, Held in the City of New York, May, 1816: Together with Their Address to the People of the United States: a Notice of Their Proceedings: and a List of Their Officers (New York: G.F. Hopkins), [On-line], URL: http://books.google.com/books?id=uXsXAAAAYAAJ&pg=PA9&lpg=PA9&dq=”Constitution+of+the+American+Bible+Society”&source=web&ots=U3Nhsz-BxA& sig=psatMhvNw81TY5k7tiMTo-3NQV8&hl=en&sa=X&oi=book_result&resnum=6&ct=result#PPT1,M1. Barton, David (2000), Original Intent (Aledo, TX: Wallbuilders). “Bibles and Scripture Passages Used by Presidents in Taking the Oath of Office,” Library of Congress, [On-line], URL: http://memory.loc.gov/ammem/pihtml/pibible.html. 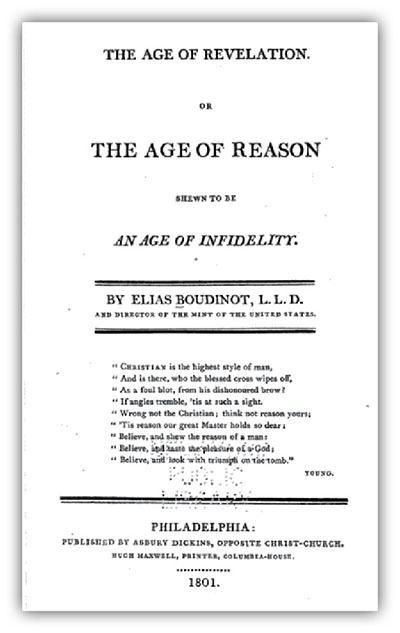 Boudinot, Elias (1801), The Age of Revelation (Philadelphia, PA: Asbury Dickens), [On-line], URL: http://www.google.com/books?id=XpcPAAAAIAAJ&q=baptized. 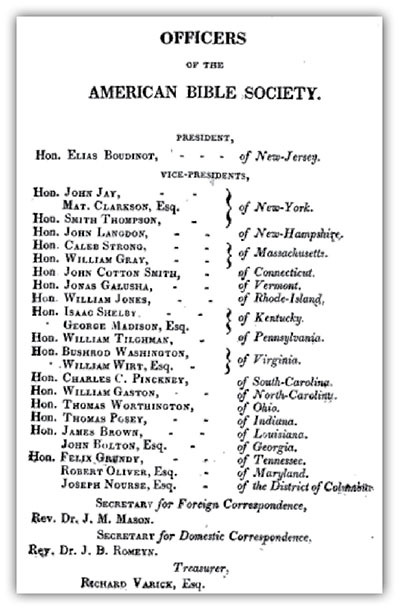 Constitution of the Commonwealth of Massachusetts, [On-line], URL: http://www.mass.gov/legis/const.htm. “Fact Sheet: Who We Are” (2008), American Bible Society, [On-line], URL: http://www.americanbible.org/pages/about-more-facts. Hamm, Brittani (2008), “Poll: Bible is America’s Favorite Book,” USA Today, April 22, [On-line], URL: http://www.usatoday.com/news/religion/2008-04-22-bible-favorite-book_N.htm. 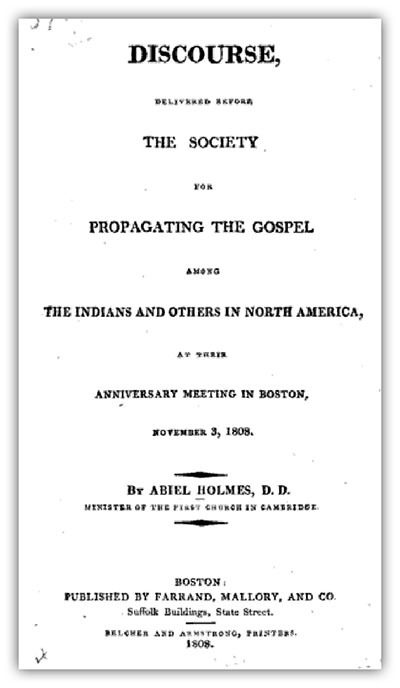 Holmes, Abiel (1808), Discourse, Delivered Before the Society for Propagating the Gospel Among the Indians and Others in North America (Boston, MA: Farrand, Mallory, & Co.), [On-line], URL: http://books.google.com/books?hl=en&id=ChATAAAAYAAJ&dq=%22Society+for+Propagating+the+Gospel+Among&printsec=frontcover&source=web&ots=CGHJcDhcpY&sig=l2TPzRA6q069U63GfH65dYp-KiI&sa=X&oi=book_result&resnum=3&ct=result#PPA64,M1. “Inaugurals of Presidents of the United States: Some Precedents and Notable Events,” Library of Congress, [On-line], URL: http://memory.loc.gov/ammem/pihtml/pinotable.html. 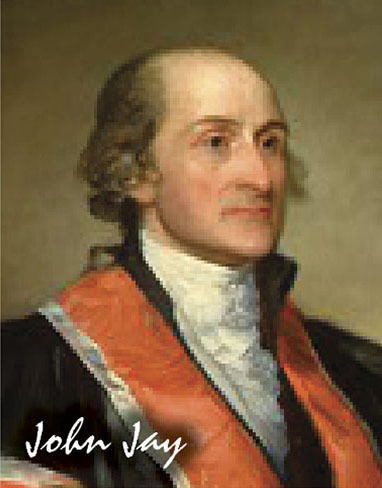 Jay, John (1980), John Jay: The Winning of the Peace. 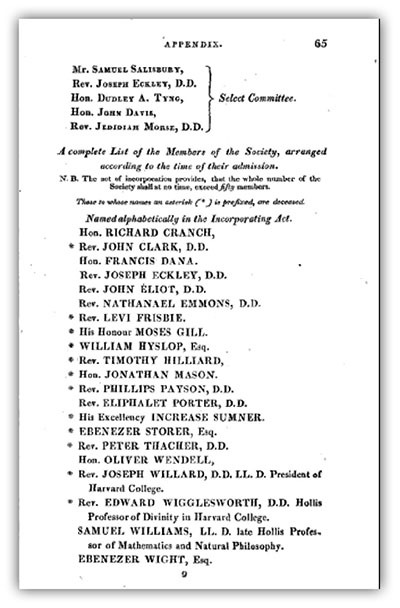 Unpublished Papers 1780-1784, ed. Richard Morris (New York: Harper & Row). Johnson, Kirk (2005), “Colorado Court Bars Execution Because Jurors Consulted Bible,” The New York Times, March 29, [On-line], URL: http://www.nytimes.com/2005/03/29/national/29bible.html. 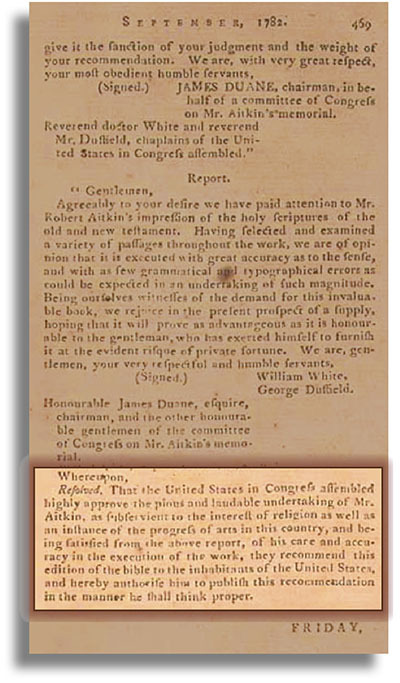 Journals of the Continental Congress (1904-1937), (Washington, DC: Government Printing Office), [On-line], URL: http://memory.loc.gov/ammem/amlaw/lwjc.html. Lutz, Donald (1988), The Origins of American Constitutionalism (Baton Rouge, LA: Louisiana State University Press). Morris, Gouverneur (1821), “An Inaugural Discourse Delivered Before the New York Historical Society by the Honorable Gouverneur Morris on September 4, 1816,” in Collections of the New York Historical Society for the Year 1821 (New York: E. Bliss & E. White). “Our Story” (no date), National Association of State and Regional Bible Societies, [On-line], URL: http://www.nasrbs.org/. People v. Harlan (2005), Colorado Supreme Court, Case No. 03SA173, [On-line], URL: http://www.courts.state.co.us/supct/opinions/2003/03SA173.pdf. “Remove Bible from Courthouse Display, Judge Says” (2004), The Associated Press, August 11, [On-line], URL: http://www.firstamendmentcenter.org/news.aspx?id=13849. Roberts v. Madigan (1990), 921 F. 2d. 1047 (10th Cir. 1990). Rush, Benjamin (1798), Essays, Literary, Moral and Philosophical (Philadelphia, PA: Thomas & Samuel Bradford). Rush, Benjamin (1951), Letters of Benjamin Rush, ed. L.H. Butterfield (Princeton, NJ: Princeton University Press). “Scripture Yanked From Grand Canyon” (2003), World Net Daily, July 14, [On-line], URL: http://www.worldnetdaily.com/news/article.asp?ARTICLE_ID=33564. Steiner, Bernard (1921), One Hundred and Ten Years of Bible Society Work in Maryland: 1810-1920 (Baltimore, MD: Maryland Bible Society). Stone v. Graham (1980), 449 U.S. 39 (1980), The Oyez Project, [On-line], URL: http://www.oyez.org/cases/1980-1989/1980/1980_80_321/. Story, Joseph (1854), A Familiar Exposition of the Constitution of the United States (New York: Harper). “Ten Commandments Judge Removed from Office” (2003), CNN News, November 14, [On-line], URL:font http://www.cnn.com/2003/LAW/11/13/moore.tencommandments/. Thomas, Cal (1996), “Silent Cal Speaks: Why Calvin Coolidge is the Model for Conservative Leadership Today,” The Heritage Foundation, [On-line], URL: http://www.heritage.org/Research/PoliticalPhilosophy/HL576.cfm. Webster, Noah (1832), History of the United States (New Haven, CT: Durrie & Peck). Webster, Noah (1833), The Holy Bible Containing the Old and New Testaments, in the Common Version. With Amendments of the Language (New Haven, CT: Durrie & Peck). Wilson, Woodrow and Mario R. DiNunzio (2006), Woodrow Wilson: Essential Writings and Speeches of the Scholar-President (New York: NYU Press). Winthrop, Robert (1852), Addresses and Speeches on Various Occasions (Boston, MA: Little, Brown, & Co.). Wirt, William (1818), Sketches of the Life and Character of Patrick Henry (Philadelphia, PA: James Webster). Copyright © 2009 Apologetics Press, Inc. All rights reserved.